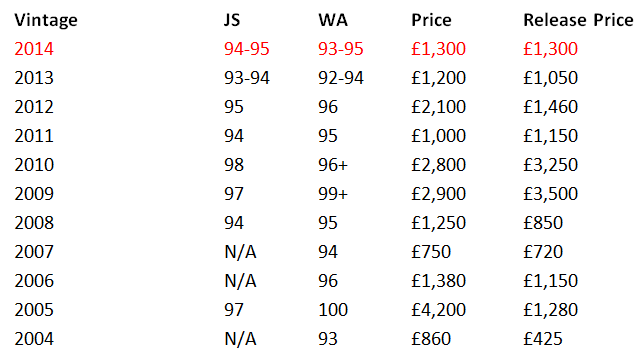 Pichon Baron released this morning at £53.33, £640 a case of 12. This is a 18% euro increase on 2013, a 5.5% increase ex-London. When we spoke to Christian Seely, managing director of Château Pichon Baron during en primeurs, he categorically stated to us that the ‘2013 vintage would be the cheapest we will ever see again from the Estate’. In fact this is even higher than the euro release price in 2012 and only the weak euro to pound means the ex-london price is 11% lower than 2012. Pichon Baron and Seely have drawn a pretty clear line in the sand here, but then they are owned by AXA. Pichon Baron made a good wine in 2014, which scored 92-95 from the Wine Spectator, 95-96 from James Suckling and 92-94 from the Wine Advocate. 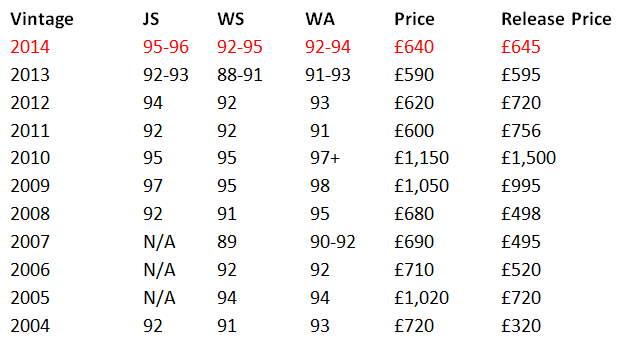 We thought the 2014 was slightly better than the 2008, which today trades at £680. L’Eglise Clinet has performed wonderfully from barrel to bottle over the last ten years, returning an average of 41%. Unlike most other en primeur wines l’Eglise Clinet has already returned 14.29% on the 2013 release since last year and 43.84% on the 2012, this very much bucks the trend. It is now considered one of the superstars of Pomerol selling out of its tiny production perennially. L’Eglise Clinet, located in Pomerol, was founded in 1803 by Jean Rouchut, who extended the property in 1882 from his neighbours, Domaine de Clinet. At that point, the two families decided to form a partnership, and wine was produced under the name Clos L’Eglise-Clinet until the 1950s. 1955 marked the first vintage sold under the name Chateau L’Eglise Clinet. Denis Durantou, the current owner and winemaker, is the 4th generation of his family to run L’Eglise Clinet. His great-grandfather managed the winery in 1914; his grandmother in 1942, and Denis took over in 1983. While his ancestors had seen the winery as secondary income to their farming and dairy businesses, Denis recognised the jewel in his hands. He completely renovated and modernised the winery, installing temperature controlled vats and adding new French oak for aging the wine. The level of quality increased dramatically due to his upgrades at the winery; the vineyards fortunately were in excellent shape and today there are Cabernet Franc vines dating back to the 1930s. More than 75% of the vineyard has vines over 20 years old, with 50% over 50 years old. The wines are vinified parcel by parcel in stainless steel vats and aged in 50%-80% new oak for 15-18 months. Only 1,000 – 1,500 cases are produced each year. Located just 1km away from the Pomerol plateau and visible from the back door of L’Eglise Clinet lies Les Cruzelles, an 11-hectare property in Lalande de Pomerol. Planted to 90% Merlot and 10% Cabernet Franc, the estate was carefully chosen by Denis Durantou for its gravel and clay soil, very similar to his property at L’Eglise Clinet. A bargain for a wine with such a pedigreed terroir and winemaker! Tim Atkin MW considers this “One of the Gironde’s greatest bargains”, awarding it 93 points, which is on par with Montrose and Ducru Beaucaillou, while Martin’s 89-91 points pits it against the likes of Talbot. We won’t be releasing many wines at £11.25 per bottle during this campaign, yet what Denis Durantou is creating here is special, more like a £30 bottle of wine and simply not to be missed. A fabulous young wine with superb depth of fruit and density that shows blueberries, blackberries, oyster shells and stones. Full-bodied, chewy yet with a laser-guided backbone of tannins. Goes on for minute. Concentrated yet so fine and beautiful. The tannin content analysis is the same as 2009 and 2010 apparently from the winemakers, but the tannin quality is better. Amazing. This could be a remake of the 2010 but fresher. The Château l’Eglise-Clinet 2014 is a blend of 90% Merlot and 10% Cabernet Franc picked from 26 September to 4 October and 17 to 21 October respectively and matured in 70% new oak. I tasted the wine from two barrels à la Burgundy with Denis Durantou. It has a gorgeous bouquet that boasts exquisite precision. It is not an intense nose but one that unfurls in the glass, revealing red berries, myrtle and more mineralité than probably any other Pomerol ’14 that I tasted from barrel. The palate is medium-bodied with very fine tannin. This is utterly harmonious, the Cabernet Franc more expressive than the 10% would suggest with a long, sophisticated finish whose cousin might be say, Vieux-Château-Certan. This continues a run of outstanding vintages from Denis Durantou and should offer 20+ years of drinking enjoyment. A wine that’s very marked by its comparatively small percentage of Cabernet Franc, this is always one of the Gironde’s greatest bargains. Grassy, elegant and leafy with dark berry and fennel notes that build on the palate, complemented by stylish, aromatic oak. Typically impressive winemaking.